No Account? Click "Sign Up" to Create One. Want a Full Media Kit? From traditional Flyers and Postcards to specialty products like our Flyer Minis, Home Brochures and our Flagship product, the PermaFlyer, we offer a Full Suite of Marketing Materials to help you sell both yourself and your listings. We can help you sell more Listings! PermaFlyers - The cure for Empty Flyerbox Syndrome. Our Eco-friendly signs are designed to replace your existing flyer and attach directly to your post. Flyer Minis - These Business Card size flyers are the perfect companion to our PermaFlyers. Use them as a Marketing Takeaway with our PermaFlyers or give them to your Seller to involve them in the Marketing Process! Hanging Signs - PermaFlyer not large enough? We've got you! Replace your dirty, dented and outdated sign with a fresh custom Hanging Sign for all of your listings. Home Brochures - Like a Video in your hand, these Modern TriFold Brochures open up to Brilliantly Display your listings. Great for Open Houses, use these brochures throughout the home for buyers to learn more. Leverage our Template Based Online Design Platform with thousands of templates available across all of our product lines. Additionally, we offer Company level templates so that brand conscious Brokerages can maintain their look as well as Client level templates for those Real Estate Agents that want to go the extra mile and have their own look. Let us help you create Killer Marketing Materials! You Sell Real Estate, We Design Cool Stuff. Why spend so much time creating Marketing Materials when you should be out Selling Homes? Design a project using your MLS Data or just type in your Listing Address and we'll pull the county records. Get your hands dirty if you want, we'll let you, or you can go Full Auto and integrate our Automated Tools to handle it all for you. Put our Platform to work for you. Choose from thousands of templates created and carefully curated by our design team. Leverage that same great team to create a custom designed template just for you. Further Customize your design by adjusting Heading and Body Fonts, Colors and Borders. Our platform allows the flexibility to ensure that your marketing designs stand out from the crowd. Our MLS integration is completely editable so you are free to rearrange as you need. Feel free to type away, if you have too much information, or not enough, your text adjusts to fit. Proof your project for accuracy and send it off to print. Why should you stop selling Real Estate just to create your Marketing Materials? Let our Ninja Design Robots listen to your feed and automatically create your Marketing Materials and email the proofs directly to you. All you have to do is approve the designs and complete the order. Don't let Graphic Design get in the way of your Real Estate business. Automation is the name of the game. From our 3 Piece NeighborConnect Postcard Campaign to our 12 Month Set & Forget Sphere program to our Homeowner Market Reports we have a Lead Generating solution to help you get more Listings. Let's work together and create more business. Dramatically Increase your chances of getting more listings with our Automated Postcard Campaign by targeting the neighborhood surrounding your listing with Just Listed, Pending and Just Sold postcards. Keep in contact with your sphere using friendly reminders of events, activities, schedules and more. Manage a campaign yourself manually, or use our Automated 12 Month Set & Forget program. Available Free with all Postcard Mailings, instantly create a Radius Mailing list around your Listing. Perfect for Just Listed, Open House, Just Sold, Pending and more. Our TraqBack QRCodes create visibility into StreetSide Marketing. Feed buyers into your network with our Client Capture system and Receive Notification when a potential buyer scans your Listings. Add to any postcard to give homeowners a Free Market Report and connect directly with you. Receive Instant Notifications that a homeowner receives their card checks out their home value. Want to send an email to your clients with your sweet new flyer? How about printing a few for your open house tomorrow? Maybe you want to embed some recipes in your monthly newsletter? Wouldn't it be cool if you could post a Monthly Events or Holiday Card to your Facebook Group? We've got you covered, it's all built in. With features like Single Sign-on, Branded Content, MLS and Social Media Integration, Drip Marketing, Radius Lists, WebFlyers and more, our Private Label Print Marketing Platform is a Cost Effective, Arms Length, RESPA Compliant Solution for your clients. 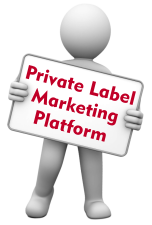 With no initial cost this customizable turn-key "Private Label" system allows you to maintain Brand Identity throughout your Marketing. Let's work together and create more business.